When I saw this week's CAS(E) this Sketch challenge I immediately thought of one of my favorite stamp sets, Happy Everything. I checked out the ColourQ blog for some color inspiration. I stamped the balloons in Glacier, Sorbet, Cranberry, and Canary inks. 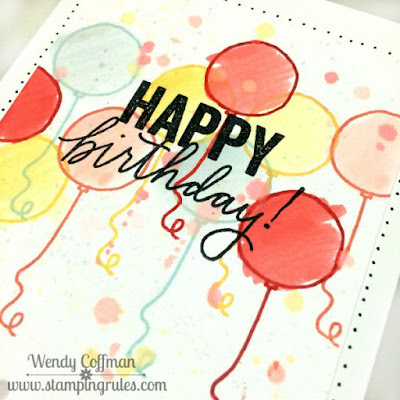 Then I loaded up my water brush and washed the balloons using the ink from the pads I stamped with, then splattered the excess around the card. I stamped the sentiment in Tuxedo Black, then added a dot detail around the edges of the card front with a fine tipped journaling pen. I'm linking this one up to the Seize the Birthday Anything Goes challenge. Fun card! Love all the happy balloons! Looks like a party! thanks for joining us at Seize the Birthday! I love this card Wendy! I love the inky, splattered color splashes. 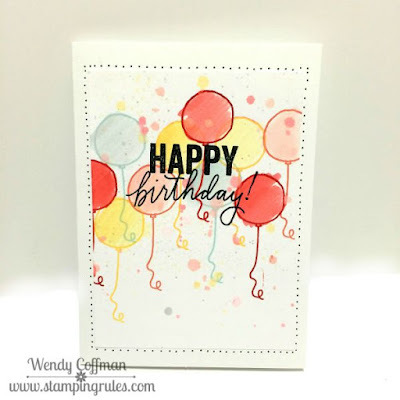 What a fun birthday card, Wendy! So glad to see you at the colourQ, thanks for playing! Love all of your balloons! This is such a fun card. Thanks for playing along with Seize the Birthday. Oh, this is so fun! I love your take on the sketch!